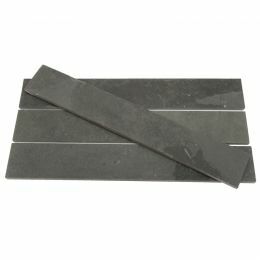 Our collection of Brazilian slate panels and strips are ideal for matching to our range of floor tiles, or for creating a design of your own. Our 3D and split-face panels offer a unique and visually interesting alternative to plain walls, whilst the strips can be used for smaller features or skirting for wall and floor tiles. Get creative with our inspirational collection. 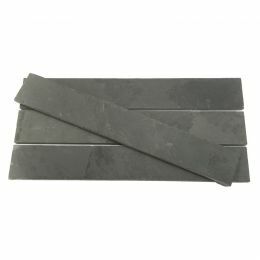 Brazilian multi-coloured riven slate strips with inherently low cleft, the tiles are a generally dark grey with a vibrant mixture of autumnal hues. 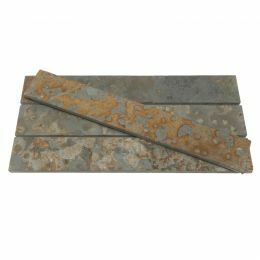 This high density stone is very durable, good for indoor and outdoor use, and can be matched to other wall and floor tiles from our range. Seal riven surfaces with a natural stone impregnator such as LTP Mattstone or Colour intensifier and Stainblock.